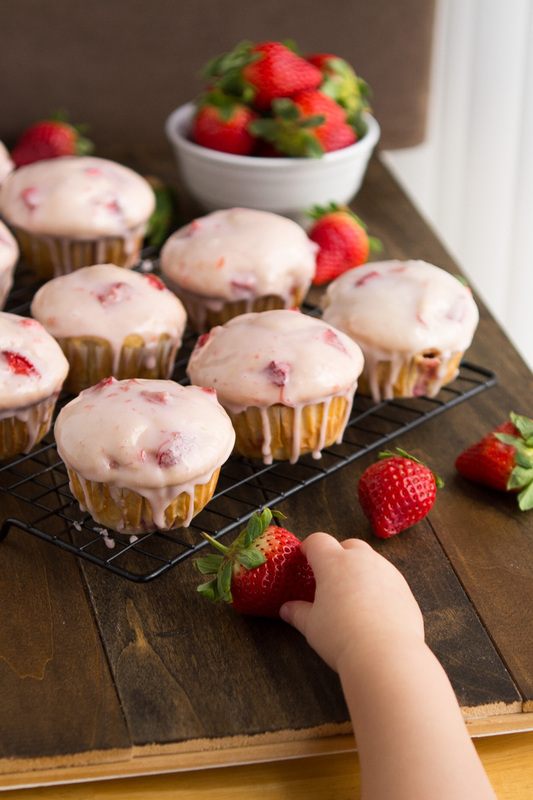 Soft and tender Glazed Strawberry Muffins are the perfect sweet treat to share on Valentine’s Day. Don’t you just love this time of the year when everything is pink and red?! It’s just so pretty! Makes me happy… especially these pink muffins. 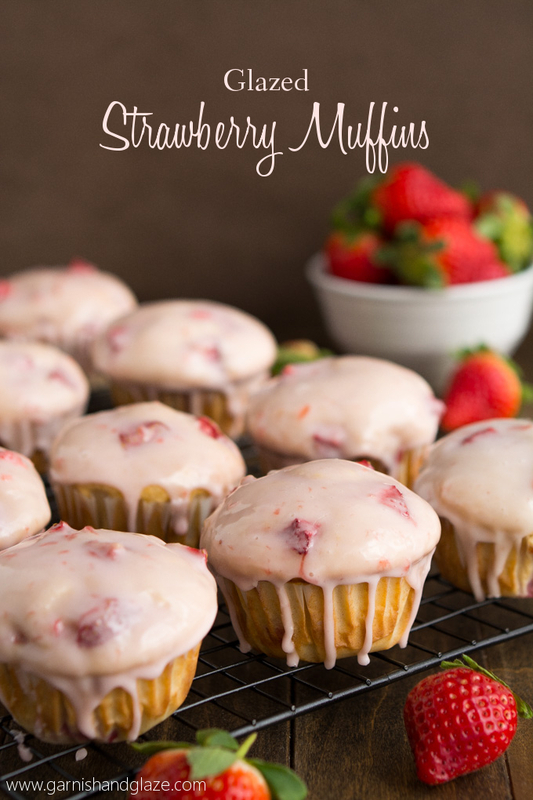 Before making these I actually never had strawberries in muffins but it’s actually quite tasty. As in I ate 3 the first day! One without glaze right when it came out of the oven (oh my gosh it just smelled so irresistibly good). Then I had to eat one after glazing/during the photo shoot. And finally, I had to split one open for a photo and I tried to pawn it off on Carly but she wouldn’t take it and you know how parents are with eating their kids leftovers. The batter is pretty easy to make. It’s slightly thick but still thin enough to fold in the berries. I wanted to make sure some berries showed through on top so I poked a few more pieces into the top after scooping the batter in. Oh and a little trick for cupcakes and muffins- use an ice cream scoop to drop the batter in. With this recipe you’ll want to do a slightly overflowing scoop into each muffin cup. 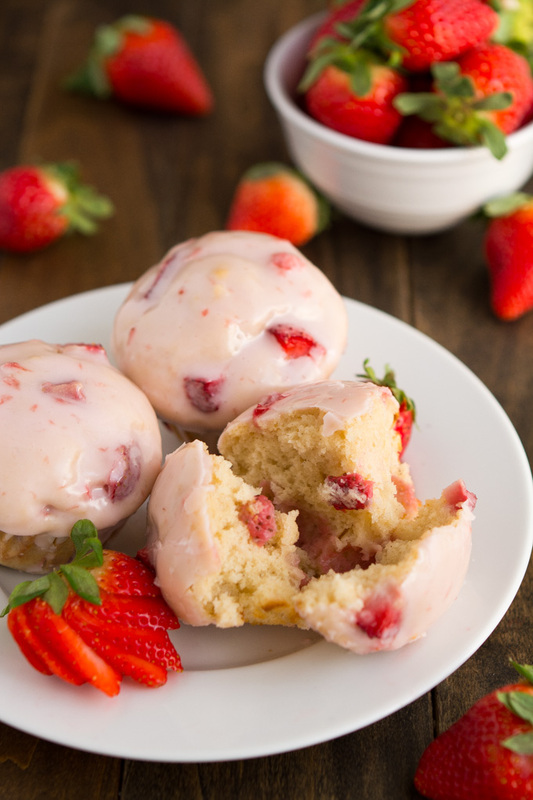 The glaze has a little strawberry jam for a little extra strawberry flavor and pink color. 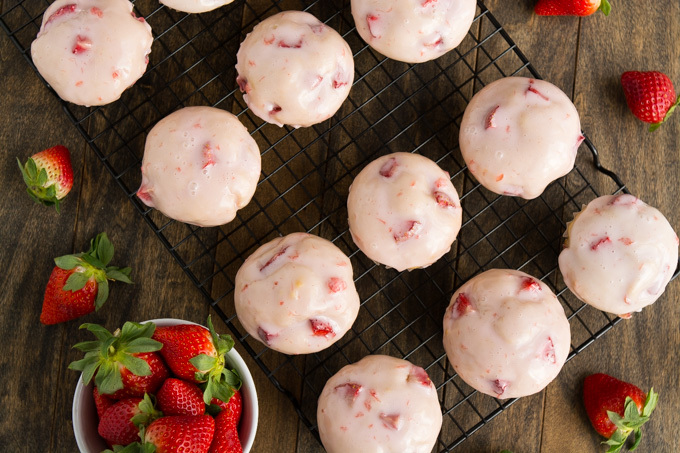 Everything is so “pretty in pink”… even these muffins. My daughter LOVES berries. Her favorites are raspberries and strawberries and lately with Valentine’s Day coming up we’ve had a lot of strawberries around. She calls them “berriezzz” in a deep voice. Gosh I love hearing her talk and try to learn new words. So despite me giving her 5 berries of her own to munch on while I finished up these photos she needed more and came up and stole a few right out from under me. It was so cute that I just had to let her and capture it. 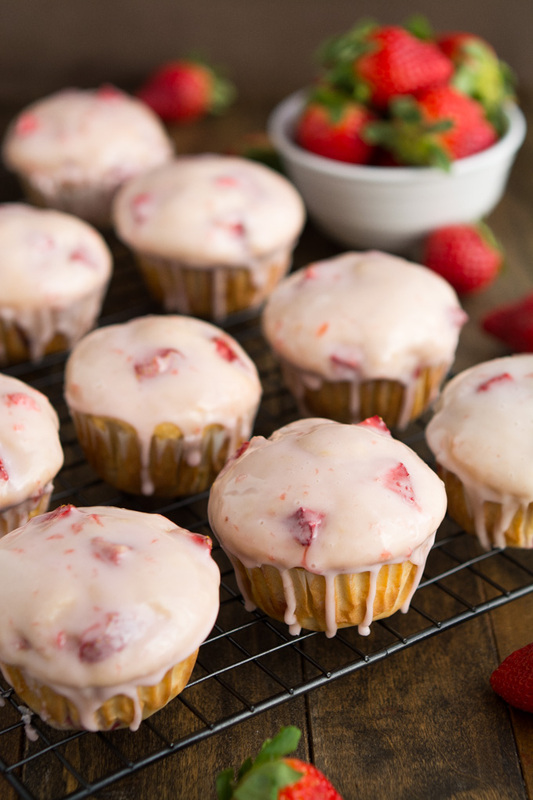 Break open that muffin and you’ll find a light and tender crumb and little bits of strawberry. So yummy! These taste so amazing warm but are still good after they’ve completely cooled and the glaze has dried. 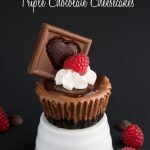 These muffins would be perfect for Valentine’s Day morning or to share as a treat at work or school. In a mixing bowl, combine the flour, baking powder, baking soda, salt, and cinnamon. Set aside. Spoon batter into 16 muffin cups (about 1/3 cup). Bake for 17-20 minutes until toothpick comes out clean. Immediately remove muffins from tin onto a cooling rack. Cool for 10-15 minutes before applying glaze. We will have to try these. We love muffins. They’re delish! You’re kids will gobble them up! 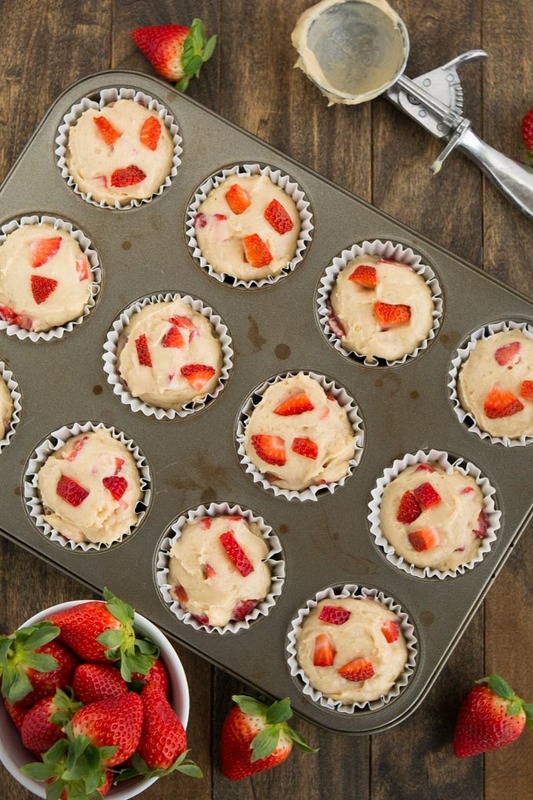 I just went to submit a recipe to foodgawker and saw these muffins right on the top line and thought, “Those are Melanie’s muffins!” These seriously look delicious! 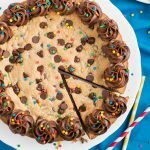 These look absolutely wonderful. Can I use frozen strawberries or do they need to be fresh? In order to make the galze, the ingredients for the glaze has to be whisk on the stove? Gaby- Just whisk it in a bowl. You don’t do it on the stove. i usually bake muffins at 350. I’m just curious why you’re baking at 400? Thanks. I’m going to make these tonight. I made these for a potluck at work. Followed directions exactly. Cooked 17 minutes. They were delicious and a big hit!!! Very moist. Not too sweet. Thanks for recipe. 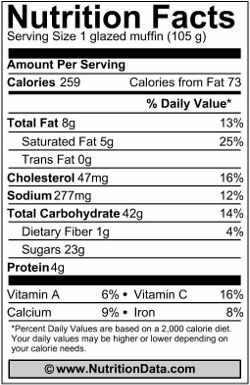 Do you measure out 1 1/2 cups whole strawberries and then dice them? I measure them after dicing. How do you store these? How long will they keep? I would like to make them for a baby shower. Thank you! 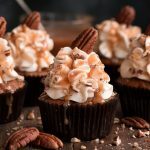 I made these this morning and they are delicious!! So moist and not overly sweet. The taste of the strawberries really comes through. How do you store these? Do they need to be refrigerated? 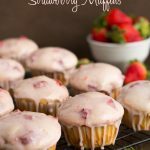 I don’t usually refrigerate other muffins with fruit in them, but I’m curious about the strawberry jelly in the glaze. Thanks! They are fine to sit on the counter a few days. Mine were eaten up by the 3rd day so I can’t tell you if they last longer than that. I made two versions of these. I made 3/4 of the recipe exactly as stated. Since my one son has an aversion to chunks, I puréed some of the strawberries and used that in 1/4 of the batter. It turned the batter a pretty pink and the strawberry flavor was more intense. I made those as minis. They were delicious! 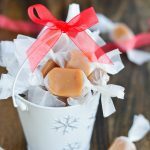 Do u think this recipe would work with tart cherries? Yes! That sounds delicious. Let me know how it turns out for you Linda.